Longtime Senate Minority Leader Harry Reid has announced that he will retire at the end of the current term, and will not seek re-election. The 75-year-old Democrat proved he was up with the times by breaking the news in a YouTube video Friday. CNN characterizes the move as a surprise end to Reid’s four-decade-long career, almost certainly ushering in an intense battle for his seat as well a struggle to lead the Democratic Party in the chamber. Last year, some democrats endorsed Senator Chuck Schumer as a replacement, but there are several other contenders. Update: On Friday morning, Reid formally endorsed Schumer as his replacement. The Senate veteran, in his fifth term of service, was dogged by retirement rumours that he consistently denied for the past couple months. Having only just survived his re-election in Nevada five years ago, he admitted that another struggle might monopolize so much money and media attention that it would adversely affect the chances of other Democratic candidates, and ultimately diminish the party’s chances of wrestling control back in the senate. We have to make sure that the Democrats take control of the Senate again. And I feel it is inappropriate for me to soak up all those resources on me when I could be devoting those resources to the caucus, and that’s what I intend to do. 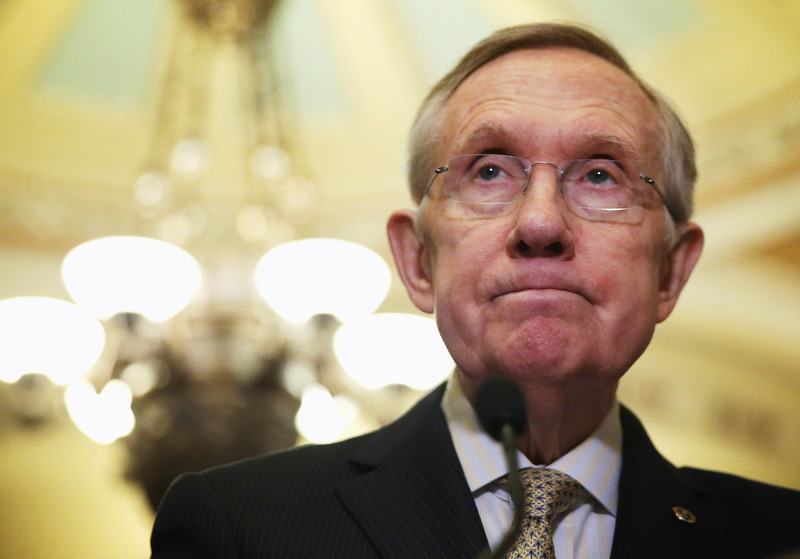 In the past two years, the Washington Times points out that Reid — first elected to the senate in 1986 — has overseen seismic shifts in the way the upper house functions. The ancient institution of the filibuster increasingly looks doomed to an ignoble end, while the ability of senators to offer and vote on amendments has been strictly curtailed. Before his current role as minority leader, Reid had functioned as leader of the majority for eight years, all up serving as Democratic leader of the Senate since 2005. In his video, Reid jokingly addresses his GOP counterpart and nemesis, Kentucky Republican Senator Mitch McConnell. “My friend, Senator McConnell, don't be too elated,” he said. “I'm going to be here for twenty-two months.” McConnell had previously attributed the GOP surge in the 2014 elections, which put Republicans in power in Congress, in part to a rejection of Reid. Nevertheless, the Times recounts that Reid had steadily maintained his dominance over the Democrats up until the video announcement. Reid’s politics had developed over his long career in office. Although he started out as a pro-life Democrat, he had more recently embraced a pro-choice stance, leading filibusters on behalf of birth control advocacy groups, and had also become more tolerant in regards gay marriage. Reid is a follower of the Church of Jesus Christ of Latter-Day Saints, and has been criticized by members of the faith for his liberal views. CNN point out that his time as Senate Majority Leader represented the highest elected office ever gained by a Mormon in U.S. history. So who will replace the veteran Reid? The Times reports that New York Senator Charles E. (“Chuck”) Schumer is considered the favorite to take up the role as party leader. Schumer assisted in the Democrats’ Senate-takeover in 2006, and last year was endorsed by Arkansas Democrat Mark Pryor. “I think possibly the best thing that could happen . . . to this institution, this election cycle would be if [Senate Minority Leader] Mitch McConnell gets beat and Harry Reid gets replaced,” the National Review quoted Pryor as saying. Illinois Senator Richard J. Durbin, the Senate’s No. 2 Democrat, is named by the Times as another contender, although the publication questions how strongly Durbin would pursue the role. A National Journal poll conducted in May last year had fifty-three percent of Democrat votes going to Schumer. Twenty-one percent went to Durbin, while the second spot was actually filled by Patty Murray, of Washington, with twenty-two percent. Republicans meanwhile voted Schumer as by far the most likely to replace Reid, with a whopping seventy-one percent. Meanwhile, the Times reports that Catherine Cortez Masto is a strong Nevada Democratic candidate given Reid’s upcoming exit. Mastro is Nevada’s former attorney general, and last year was appointed executive vice chancellor of the Nevada System of Higher Education.